As the star of Hercules, Goliath, and dozens of other bare-fisted, bare-chested adventure flicks, Steve Reeves helped lay the groundwork for latter-day action icons like Schwarzenegger, Stallone, and Van Damme. 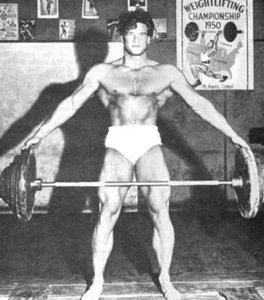 He also happened to be an accomplished bodybuilder during his day, winning the 1947 Mr. America and 1950 Mr. Universe titles during a brief but successful competitive career. Place a loaded barbell on the floor with the smooth sides of each plate facing inward if applicable. If you can use multiple 20kg’s on each end, place a 5kg plate between them to create space for your fingers.